The original religious image of the white Nazarene located at the Immaculate Conception Cathedral after the World War II bombing in 1944. Organizers of the Feast of Nazarene and the Immaculate Conception Cathedral (ICC) are seeking to enrich the history of the “White Nazarene” in Palawan by conducting a study about its past. Feast of Nazarene organizer and chairman JR Palanca Golifardo said Tuesday that the study will be done in coordination with the National Historical Institute (NHI). “Sa ngayon magkaka-conduct pa tayo ng research, magkoko-coordinate pa tayo sa iba’t ibang ahensya like National Historical Institute, mapa-translate kung ano ang totoong nakasulat sa likod ng Nazareno, kailan siya ginawa, sinong gumawa, saan siya nanggaling. Makita rin sana natin kung saan gawa ang kahoy. If may further study, mas maganda, mas ma-enshrine natin ‘yong history for posterity na rin ng mga susunod na henerasyon,” he said. He said he wishes to pursue the research after the Feast of Nazarene on January 9. 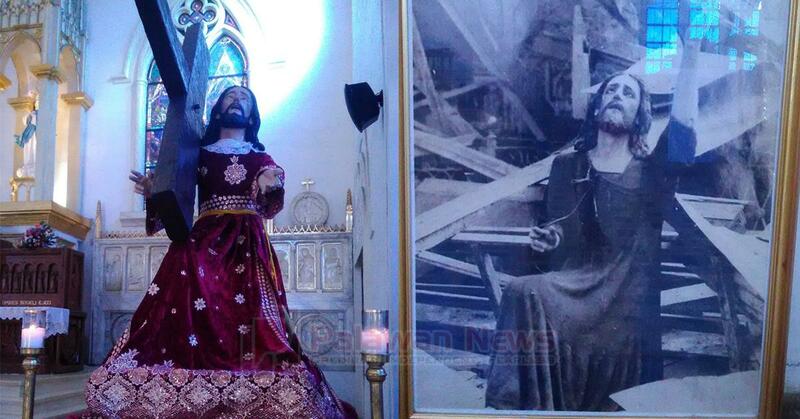 Golifardo stated that based on local history, a lifesize Nazarene was found by the Americans in the wreckage of a cathedral that was bombed during World War II. He said it was documented in 1944 by an unknown photographer along with the Immaculate Conception. Golifardo said that after the discovery of the “White Nazarene”, Palaweños became devoted to it. However, this dedication appeared to have waned due to the advent of technologies. “After noon, nagkaroon ng devotion ang mga taga-Puerto, ang mga taga-Palawan sa White Nazarene. Ang kaso pagdaan ng panahon, nakalimutan, nawala na naman, tumamlay na naman dahil siguro sa mga innovation, technologies, nawala ang devotion (After that, residents in Puerto, in Palawan, became dedicated to the White Nazarene. But after time passed by, they forgot about it, they became dull maybe due to innovation, technologies, they lost devotion),” Golifardo said. Golifardo also noted that the “White Nazarene” also symbolizes the daily lives of the poor and their faith to the Nazarene similar to the devotion to the “Black Nazarene” in Quiapo, Manila.